Finally!!! I am done with my latest mini project. I am pretty infamous for starting projects and never finishing them... or taking a good two-three years to finish something. This one only took me a month. I used an empty paper book I got on Christmas clearance at the craft store. I thought of using a real book but I knew it would take me forever if I did that. Maybe next time. I decided to make a bookbinder's studio in 1:12 scale, complete with handmade books and all the tools of the trade. Check it out. I painted it a cheery light blue to offset all the dirt and distress I added to every nook and cranny. I also used a lot of warm woods to give it a cozier feel. 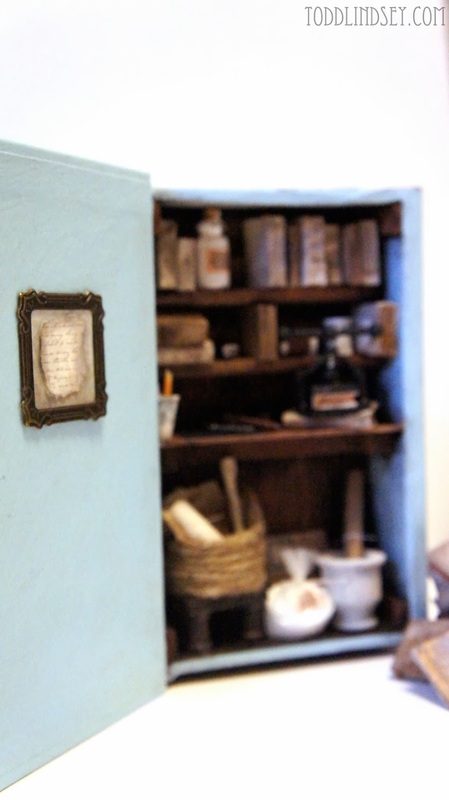 When you "enter" the scene, there is a frame on the blank wall... aka the inside cover of the book. 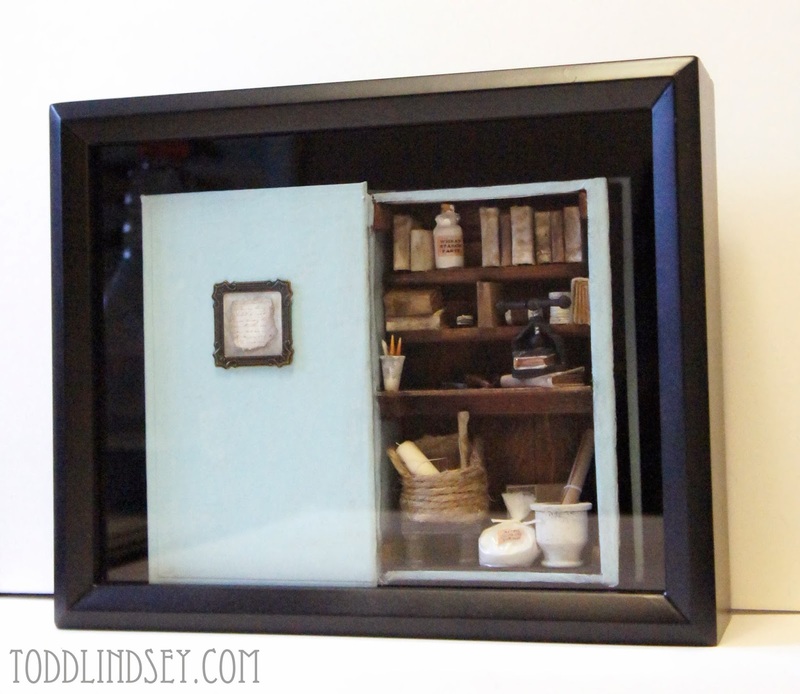 The frame is from my DIY Dollhouse Frames post. I used my latest favorite pad of scrapbooking paper for the artwork. 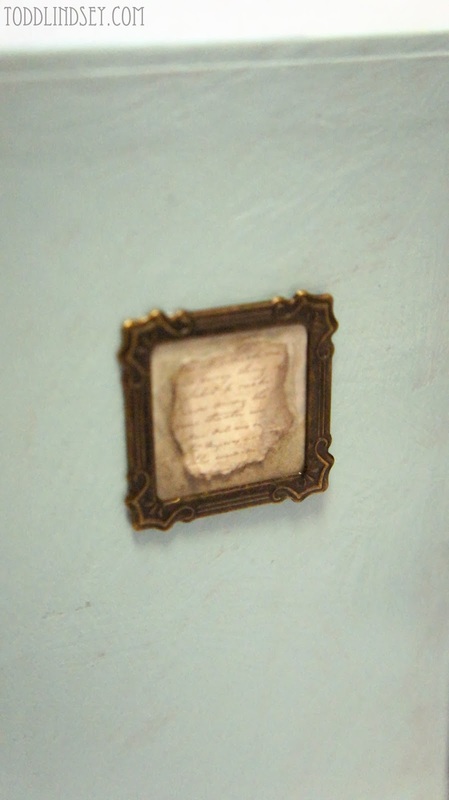 There is a paper of teeny tiny cursive writing and behind it, a light blue-gray and cream floral pattern. I used the same blue-gray paper for the ceiling inside the book. 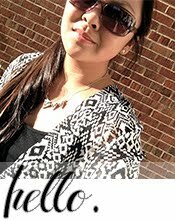 Check out all my mini books! They all open and close. The pages can be turned except for the open one... I had to glue those pages open. The pile of books on the ground are all extras and didn't fit into the scene. I promise I will find a great home for them in my dollhouse! I didn't do much to the outside of the book. I originally was going to cover the outside with coordinating papers but I figured once I framed it, no one would be able to see it. Everything inside is handmade or altered by me. 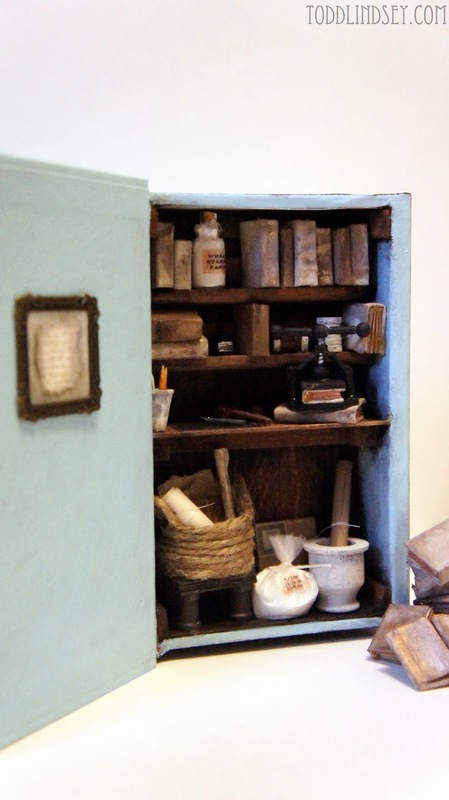 The top shelf has several books and a bottle of messy glue. 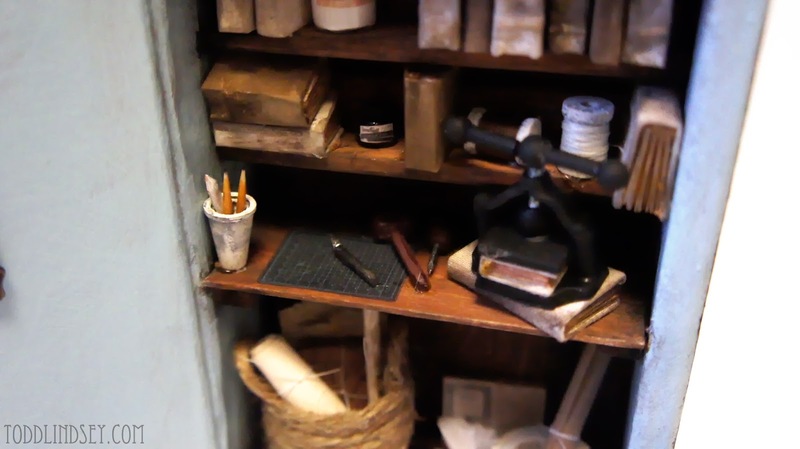 The other shelf has even more books, a bottle of black ink and two spools of binding thread. The desk area has a self-healing cutting mat and an exacto knife, blade bared. There is also a mallet and an awl for punching holes. The pencil cup is made from a glue cap. Inside the cup is a bone folder and two pencils made from toothpicks. 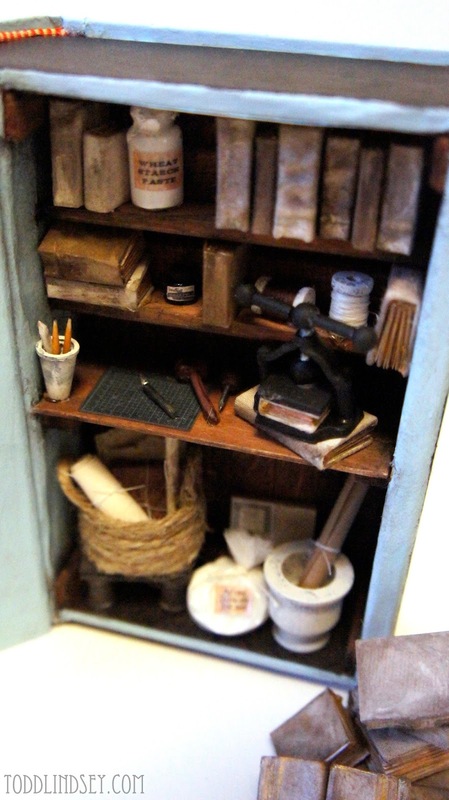 On the right of the desk is a book press made from a screw and polymer clay. I love it! The floor has a dark wood herringbone pattern but there is too much stuff to see it! 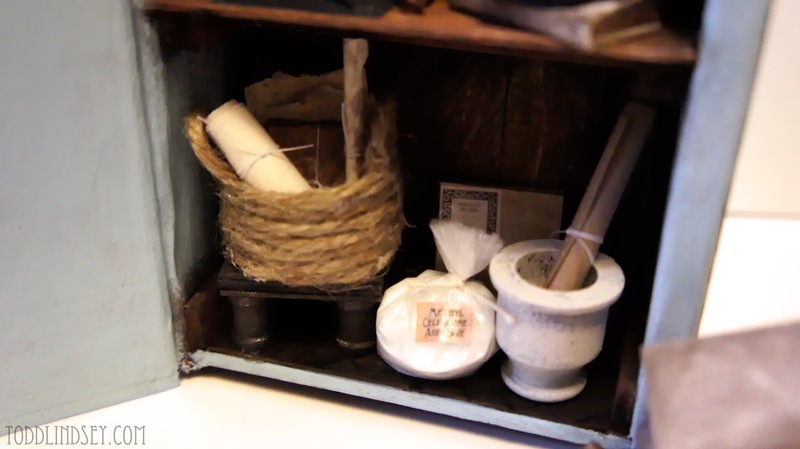 There is a handmade stool with a twine basket holding handmade papers. The papers were both handmade by me and bought from other artists. In the shadows, you can see brand new book board, still in it's original packaging. There is a bag of methyl cellulose for mixing more glue and an urn for additional paper storage. There it is all together! You can really see here that I didn't do much to the outside. 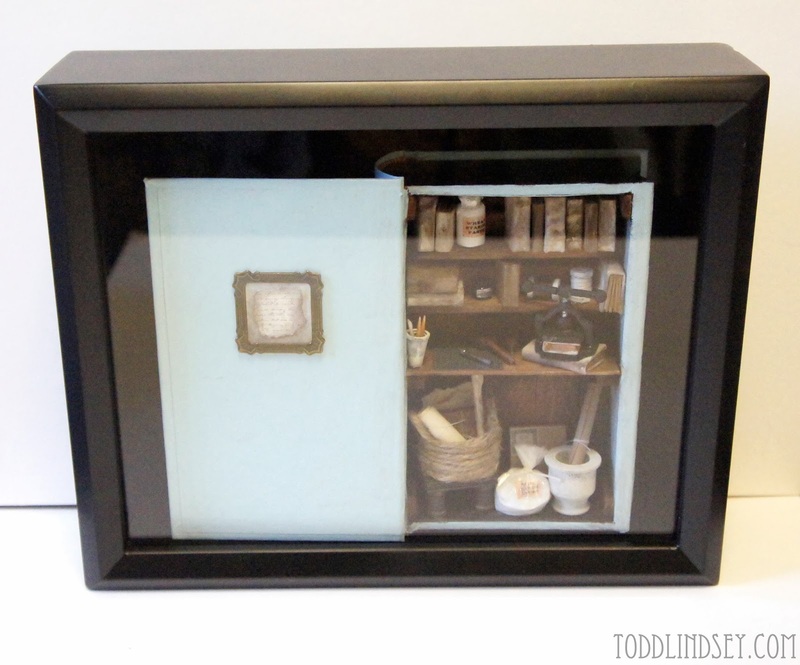 I put the whole book scene in an 8x10 shadowbox. Sorry for the quality of these pictures but the glare made it pretty difficult to photograph. 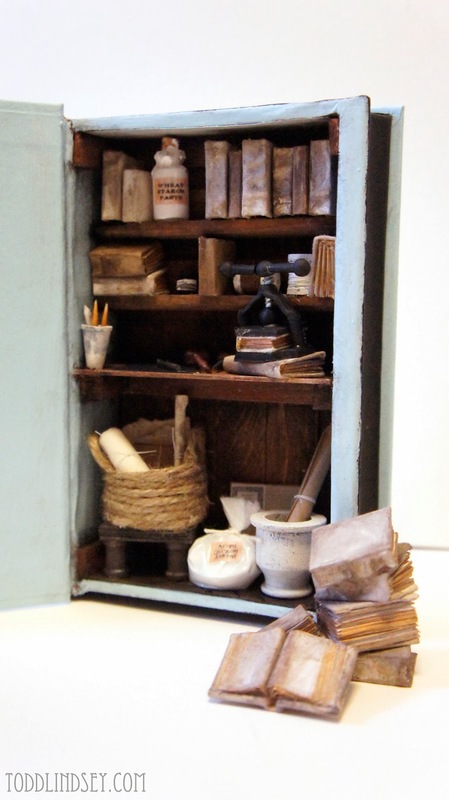 And there you have it; the Bookbinder's Studio. This is amazing! 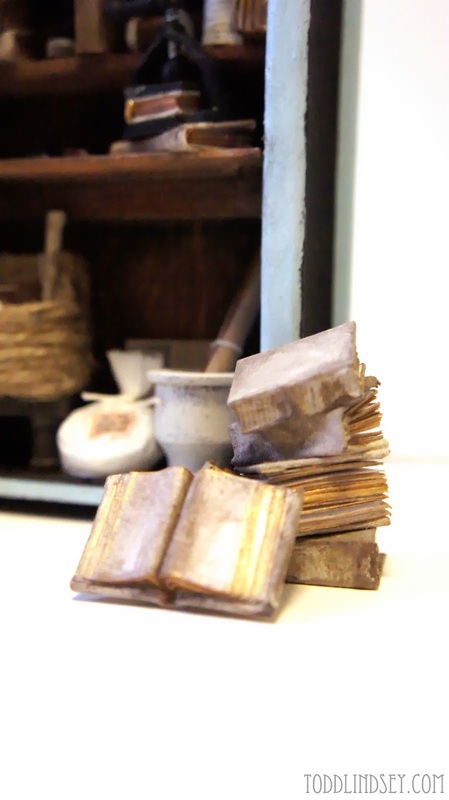 I like the mortar, or what looks like a mortar and the stack of books. 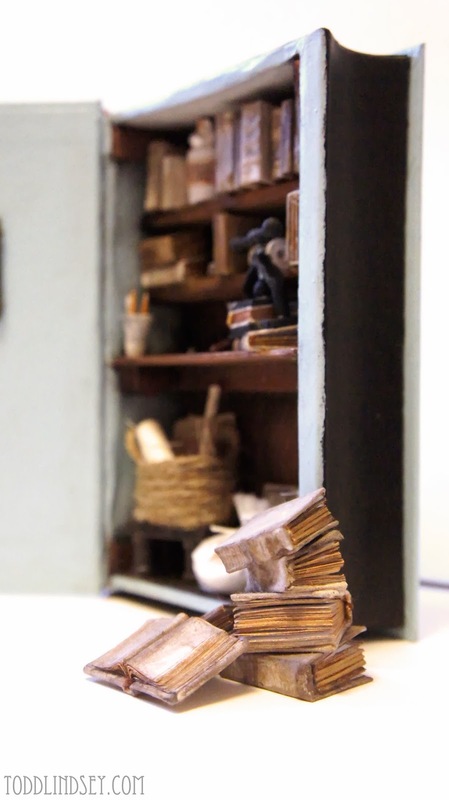 I really love all of the different elements you incorporated into this little space! 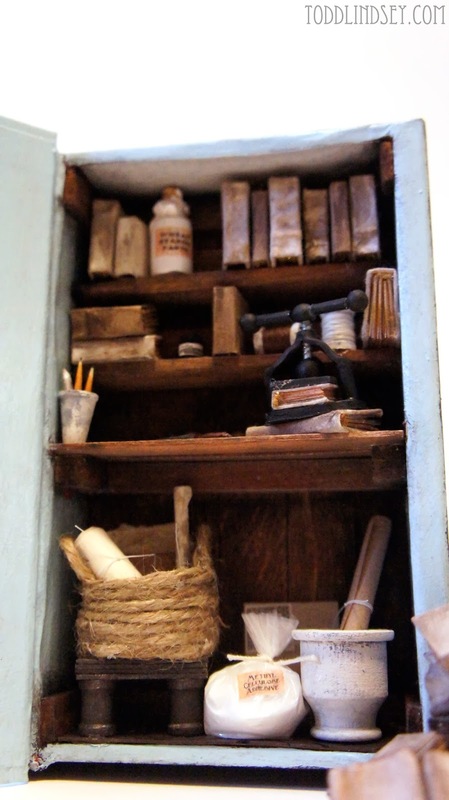 The books, basket, tools, mixing items...everything really looks beautiful. Great job! Pure genius. Your composition and placement of the items in the shelf are just fantastic. It is such a great project and the accessories you used are perfect. I love the color...It is just lovely! 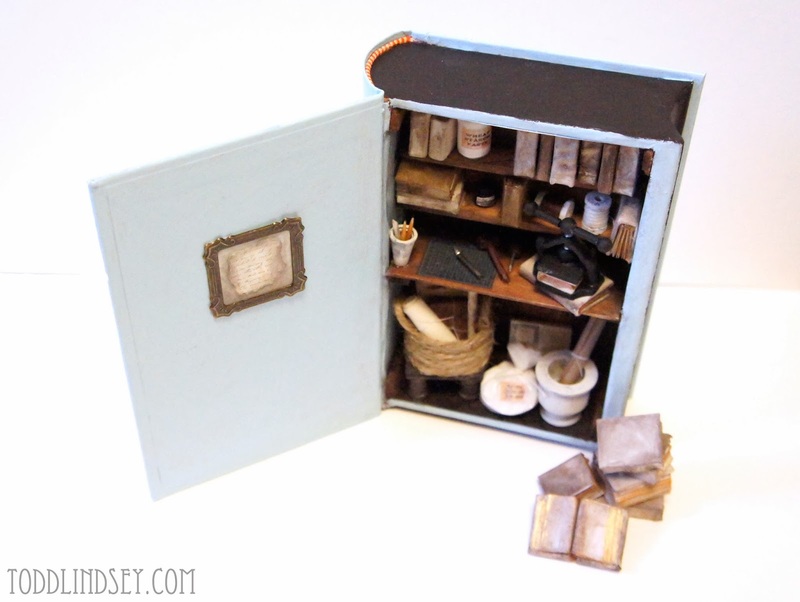 It's great to see your mini projects! It's super cute! I love the entire piece. You put so much work in all those details. It's gorgeous. And thanks for subscribing to my Youtube! I subscribed to yours too. You might load something one day. And I want to be the first to see it! Such a wonderful scene! 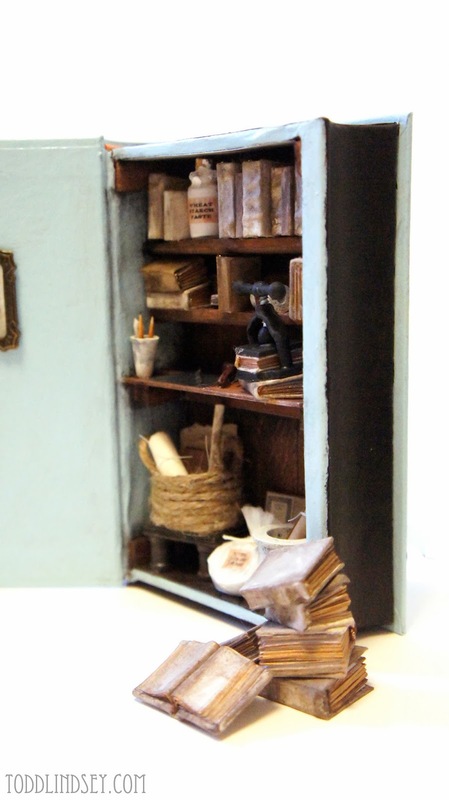 I love LOVE book scenes, my goal is to make a library scene someday ;) A wonderful idea for the paper book and it makes such a perfect shadowbox! Fantastic! I like your creation. Very original. This is super fantastic! Love the books, the basket, the press, well everything! Such detail. Clever to frame it and keep it safe from dust. Magnificent work of Art! WoW Linsey!!! This book is absolutely stunning!! 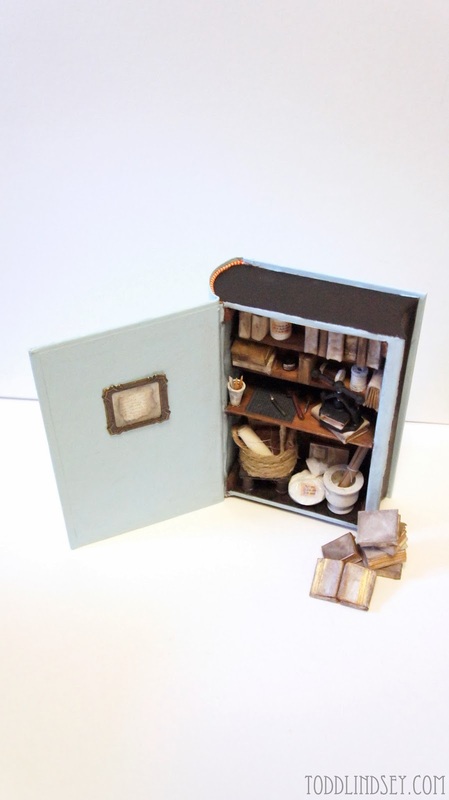 I love all books that inside have a surprise or a treasure....so cute and so well made!!! Superb job!